The Westboro Baptist Church isn't officially Baptist. The Topeka, Kans., church is actually a unaffiliated congregation run by a pastor named Fred Phelps, whose followers consist largely of members of his extended family. Phelps and his crew are known for their antihomosexual stance and their strong fondness for picketing. Westboro claims to have protested over 40,000 organizations and events (including Mr. Rogers' funeral), but they are most famous for their picketing of U.S. soldiers' funerals. In 2006, Albert Snyder, whose son Matthew was killed in Iraq, sued the church over their protest of his son's funeral. 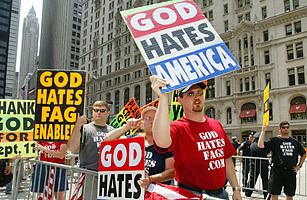 During the service, Westboro members reportedly held up signs that said "God Hates the U.S.A." and "Thank God for Dead Soldiers." Snyder won the lawsuit, but the decision was later reversed on appeal. Snyder, with the help of the attorneys general of 48 states and the District of Columbia, has appealed the case to the U.S. Supreme Court. The court is scheduled to consider the case on Oct. 6.